How Do I Integrate My 3dcart Store With Square POS? The Square Point of Sale (POS) software allows you to sell products through popular iOS and Android platforms such as a phone or tablet while collecting payment through Square's integrated payment solution. 3dcart's integration with Square POS allows you to export products from your 3dcart store and upload them to your Square POS. It will also let you import products from your Square POS app to your 3dcart store. Furthermore, on hand stock of the products shared between the two services will automatically synchronize as they are purchased and removed from inventory. The following assumes you've already set up your Square account. If you don't have a Square account set yet, click here to begin creating one. Next, click on the "Settings" link within the module. Set the online store "location" (from your Square account) that you'd like to connect your 3dcart store to*. If any of your Square POS App locations are not in the drop down, click on the "Actions" button (found along the top right) and select "Refresh Location List." Square allows you to create multiple profiles for locations where you may be running the Point of Sale app; each with their own business hours, product lines and more. When you connect the 3dcart module to your Square account, the locations drop down menu in the 3dcart module will contain your locations within it. Click here for more information on managing multiple locations with Square. As mentioned, product inventory will synchronize between the two platforms as items are sold in either interface (Square POS or 3dcart). Product inventory will also be synchronized to Square when updated on the 3dcart platform. However, it is important to note that if you update product inventory on Square, it will not update on the 3dcart store. Therefore, it will be best practice to update the stock always on the 3dcart store to have everything line up correctly. Once your initial settings are configured, click on the "Save" button at the top right of the page. Your next steps will be to configure how products will be shared between your 3dcart store and the Square POS app. Depending on how you'd like to set up the integration, you can import products from your Square app to your 3dcart store, or send products from your 3dcart store to the Square POS app. We'll cover both in the next sections. Look to the top right of the page and click on the "Actions" button. Select the option marked "Export Products To Square"
The module will begin the process of uploading products to your Square account*. The product's options must be set as Advanced Options in order to be sent to Square. Please also be aware of the following when uploading items from your 3dcart store to your Square POS. Depending on the size of your catalog, the export process may take some time. Stores exporting more than 5,000 items will experience significant delays. While 3dcart allows you to use several image formats for product images, Square tends to prefer JPG and PNG images. The export process will export your categories first before uploading your products. If the product is assigned to multiple categories on your 3dcart store, it will be exported into Square using only one of those categories. This may result in items being added to Square in a manner that you don't intend. Furthermore, since categories are exported into Square first, this may result in empty categories when seen on the Square POS app. Fortunately, you can manually update the items and categories on Square as needed - after they are exported. Even if the items on your 3dcart store are marked as hidden or Not for Sale, they will be part of the export to Square. You may manually remove them from the Square POS after export. Once the export process is complete, you will see a section at the bottom of the module setting page which will detail the status of the export process. This will include the number of categories and products found and synchronized as well as any errors that may have been found during upload. Select the option marked "Import Products From Square"
The module will retrieve your list of products that are set up on the Square POS app and display them in a grid for you. This action should occur automatically, but if your products are not displayed you can click on the "Fetch" button (located on the top right) to refresh the grid. To the left of each grid item will be a checkbox which you can select to mark which products you'd like to import from Square. Look to the top right and click on the "Next" button. The category will not be imported from Square. Products for the category will still be added to your store, but they will not reside in any specific category of your 3dcart store. 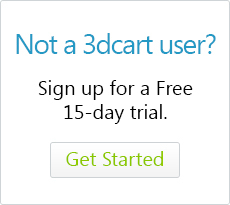 Select this radio button if you'd like the categories to be created as new on your 3dcart store. Select this radio button to have the categories mapped to categories that are already present in your 3dcart store. When selecting this radio option, a popup window will appear showing your store's categories. Click "select" to choose which category to map to. The module will connect to your Square POS App and download the selected products (and categories) and populate them onto your store*. When the item on Square has variations, each variation has its own SKU. However, the root/base product does not contain a SKU. Instead, it is treated as a unique variant of the product known as "Regular." It will be treated the same way upon import to your 3dcart store. The base product will be created without a SKU and with the first variant listed as "Regular"
This will reset your Square POS integration completely and sever the synchronization process.